Log Roll “1-2-3” or “Ready-Brace-Roll”? To be honest, I don’t really mind when a log roll is done. Sooner rather than later, providing it doesn’t impact on initial assessment and the primary survey (whether you use ABCDE, C-ABC or my preferred, the MARCH approach). 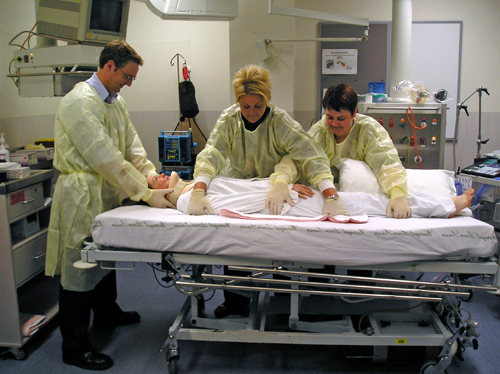 Given that it is best to avoid repeated handling of the trauma patient (I am a big fan of scoop mattresses and early application of ‘splint-to-skin’), it makes sense to me to get the clothes off and inspect the back of the patient as soon as possible…assuming other priorities such as airway protection, finger or tube thoracostomy & fluid resuscitation are under control. In a rural location, I am often dealing with well-meaning volunteers (ambulance officers and fire brigade, or even passers-by). How often have you heard this instruction? It seems clear enough, right? Maybe it is…maybe it isn’t. My experience is that even when this command is clearly articulated, about 50% of people will roll on THREE…and 50% will roll on the implied fourth beat (“1-2-3-roll”). Which can be disastrous when the patient has a spinal injury. It can also injure team members who may not be ready themselves. I remember one anaesthetist who used to just bark ‘Right 1-2-3-go’ and woe betide anyone who wasn’t ready. Lines got pulled out, staff got back injuries. Did he notice? Of course not, he was Team Leader and a Consultant – who could dare challenge his authority?. It’s a bit like that infamous scene from Lethal Weapon 2 (25 years ago…OMG) when Detective Roger Murtaugh (Danny Glover) discovers a bomb hidden on the toilet and fellow Detective Martin Riggs (Mel Gibson) decides on the bold move of pulling him off the toilet seat…the whole scene revolved around the question of whether to go on ‘3’ or not? Of course it’s not just about safely log-rolling the trauma patient…clear instructions are essential in theatre when sliding the patient from operating table to recovery trolley, when lifting a patient from the floor onto a bed after a fall…or in the resus room when sliding the patient from ambulance trolley to bed..as well as in the CT scanner. So many potential moves, so much potential for harm. Which is why I abandoned the ‘1-2-3’ crap many years ago and instead always use the command ‘ready-brace-roll’ (or slide/lift etc). I do this for every case in Theatre…and although my colleagues may take the piss 9there is some resistance to this, amazingly), I find that it translates well to ED and to the roadside, especially when working with an unfamiliar team. Of course you can substitute SLIDE with ROLL or LIFT as appropriate. Try it – it may make log rolling of your trauma patient just that little bit less random…and save both your continence and your lower back for the future! Manual Handling is something that is drummed into nurses from Day 1. From the rules about where to position a bed for making it, to the best way of getting a pt who has collapsed & is unconscious in a bathroom back onto bed. We have mechanical equipment, slide sheets & an abundance of helpers when needed if you are fortunate enough to work in most metro and regional health facilities. We get taught and are sent along to yearly mandatory education when working for public health for refresher competencies. Ready Brace Move is what we are meant to use. Although after years and years of 1-2-3 and the usual confusion you talk about, I have found many still use that. I have seen at least 5 nurses in my time go from fully functioning, working full time, to workers comp, often surgery, chronic pain & rehab, return to light duties and eventually be out of a job when they cannot return to full duties. Its real quite sad. This basic training should be given to Docs just as they are to other clinical & allied staff are. It only takes 10minutes to give Docs the tips they need. Everyones backs, shoulders & so on are worthy of it. Yep, agree. However manual handling is not part of our training (yeah, yeah… I know) and on courses such as EMST or REST the 1-2-3 mantra is usually trotted out. 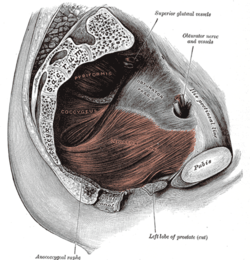 My point is that 1-2-3 is inherently flawed; there is no ‘stop point’ (is everyone ready), nor subtle instruction to protect back and pelvic floor (brace) and has a momentum of it’s own that can be hard to stop. It also plays to the unconscious ‘1-2-3-GO’ vs ‘1-2-3’ ie a different endpoint even with same brief. Add to that disparate team members – ambos, nurses, doctors, fire brigade, passersby, orderlies – not necessarily with same training. “Ready-Brace-(Action)” works and whilst can be embedded in manual handling training, can also be taught in a flash team with untrained. People DO take the piss out of me for doing this….especially in theatre or in ED (sadly often those same RNs who have undergone manual handling! )…but like you, I have also seen staff get injured when someone barks 1-2-3 and moves patient without checking either readiness or timing of move. I have had the luxury of working with the same 10 nurses for years – so we know the rhythm. Agree in a novel team – best to use words with meaning. 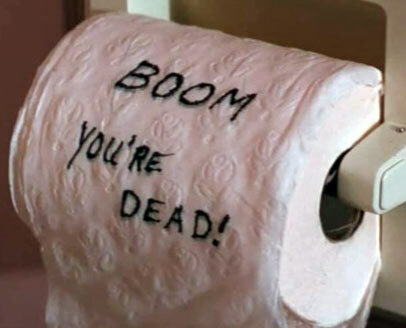 Maaaaaaate…you need to watch ‘Lethal Weapon 2’ bomb-on-toilet scene again….if only for the full action mullets. What happens if. I come up and locum? Will there be chaos in theatre? I really like the “ready, brace, [action]” sequence. I’ve been the roadside (first responder) bystander that refused to let the three firefighters carry a lady up the steep loose gravel slope without additional help. If I’m qualified to maintain c-spine while they get a hand-off from my companion and extract the patient I’m probably useful muscle for getting the patient safely on to the gurney at the roadside. Cheers from the USA! I’ll be linking to this post very soon. Great idea, great article! Will be reading the rest of your posts shortly. Thanks for writing! An interesting article. FYI the Australian Defence Force doesn’t use a 1, 2, 3 lift count for moving objects around. It’s taught in recruit school that the saying is “prepare to lift, LIFT” and there is a training session from the physical training instructors on this very thing. This is only a point of view from the Australian Army but I think it’s standardised across all three services. It’s good that they have seen lethal weapon and realise the confusion that can come from the one, two, three count. WA Ambulance Service has also moved to something very similar with “prepare to life, LIFT” too. Personally especially at the road side with untrained bystanders I’ll have people get into position, do a briefing of what we are going to do, what route we are taking, what we are doing at the end point too. I’ll physically make sure that no one is touching the stretcher when explaining the calls and prefer not to use the counting method. Much simpler and no confusion.There’ll also be a check to see if everyone is ready before the “prepare to lift, LIFT” call too. Funnily though Royal Darwin Hospital ED still use the counting method. Completely agree with ready-brace-lift etc. Just an additional thought – I’ve found that asking “Is anyone NOT ready?” is particularly good. It encourages people to speak up more whilst also having the benefit of not having those who are ready saying yes and making it harder for you to hear anyone’s objections. Interesting cases. I am still keen on 1-2-3, where it is done right. But first. Military do say, for stretcher lifts, ‘ Prepare to lift, Lift’, but then they just say ‘Forward’ and then they might say something helpful like ‘Ramp’ (onto the blessed ambus) or ‘Steps’ and eventually the front left person is responsible to say ‘Halt’ (one hopes!!) and they then make a point of not saying ‘Prepare to lower’ before that final executive command. So let’s not cite military dogma as something to be attended. So in theatre or ED, I will always give a little brief along the lines of ‘The executive command will be the number 3. The instruction will be rolling patient 45 degrees left 1-2-3. If anyone has concerns, they are to say Stop or Wait or something and that is what we will do.’ The each move states what we will do, for example ‘Rolling Patient and blue sheet to the left 1-2-3’ and it always goes smooth. I give a nasty scowl if anyone else counts before I am ready and we have enough people and always look and ask if everyone is happy, checked lines, the obvious stuff. Unambiguous leadership in this simple task makes it quick and easy and safe. Having said that, the final word in counting goes to Maverick in Top Gun, when Tom Cruise jinks and the filthy commie flies right by: ‘On the count of three, break hard right. Three… two… one… break right!’ Makes Mel Gibson look quite professional.